« Christine O’Donnell was a witch and now has become … me?!? 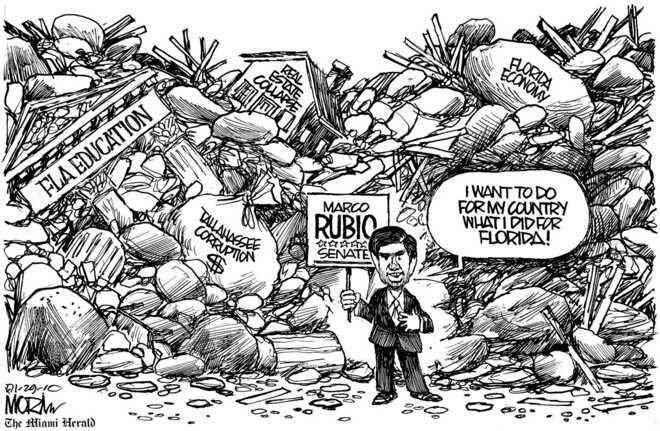 Sun Sentinel endorses Marco Rubio – Aren’t they paying attention? The Sun Sentinel’s Editorial Board shockingly endorsed Republican Marco Rubio for Florida’s U.S. Senate seat being vacated by George LeMieux. Their main argument for the endorsement was that Rubio’s ‘fiscal conservative stances will move the Democrats to the center.’ Clearly, the paper believes that the Republicans are fiscal conservatives which with a little research will prove to be completely false. Just look at the spending under Presidents Ronald Reagan, George H.W. Bush and George W. Bush. The spending on the auto bailouts and cash-for-clunkers have already paid off as the American auto companies are now doing well and have already begun paying back the money from the bailout. The stimulus program has generated many jobs and more importantly saved thousands of others. 9,000 teachers in Florida alone had been rehired thanks to the stimulus. Experts show that the unemployment rates would be 2-3% higher without the stimulus. More unemployment means more home foreclosures and less spending which means more small business would fail. Now back to Rubio: The implication is that Rubio is fiscally conservative which is incorrect as well. First, one only has to look at his own financial record. In 1999, Rubio reported his earnings at $99,000. In 2008, it was up to $414,000 even though Rubio’s net worth was listed at just $8,300. The Sun Sentinel called Rubio ‘fiscally conservative’ yet Rubio is carrying nearly one million dollars in debt which includes 2 mortgages on his current home and over $100,000 in student loans. That also doesn’t include the house that Rubio and David Rivera shared in Tallahassee that earlier this year saw the lender begin the foreclosure process. Once this information became public, Rubio made good on this loan, then claimed the house was never in foreclosure saying it was only a smear attempt by the Charlie Crist campaign. This so-called fiscal conservative is also currently under IRS investigation for misuse of a Republican Party American Express card for personal expenses. So, if the Sun Sentinel really believes that Rubio will help control spending, they are sadly mistaken. Questions of Rubio’s ethics also come into play as he profited financially as a result of being in the House leadership. Between 2002 and 2005, law firm Broad & Cassel billed Florida taxpayers $4.5 MILLION for legal work. An audit of the firm’s work was conducted but never released. Additional deals Rubio received after leaving state government: Miami Children’s Hospital paying him $102,000. Florida International University – $69,000. Univision – as an on-air commentator for $8,000. These deals call into question Rubio’s ethics and how he’ll work to personally benefit while in Washington D.C. This race is interesting because there are actually 10 people running for the vacant seat but only 3 are getting any press. Both former Republican turned Independent Governor Charlie Crist and Democratic Congressman Kendrick Meek will make good United States Senators. Both are worthy of our votes. The reason, I endorse Crist over Meek is simple. Meek is a staunch Democrat who will stand with the Democrats in the Senate which does nothing about ending the partisan politics. Rubio promises to Obstruct every issue standing with the Republicans on everything. This obstruction has actually hurt the progress of economic recovery. In fact, Republicans have added little to the debate since losing the White House. Crist meanwhile has always shown a propensity for trying to find common ground on every issue regardless of party line. I have found evidence dating back to his time as Florida Attorney General. His opponents call it flip-flopping but the truth is politics is not black-and-white. There are many shade of gray with each issue. This article is more about the Sun Sentinel’s terrible endorsement rather than who I endorse. If you are seeking a candidate that will continue the extreme partisan politics, has personal fiscal irresponsibility, major ethical problems and is currently under IRS investigation – then Marco Rubio is your candidate. If you support someone who has demonstrated that he will put party and self before the American people – then the Sun Sentinel made the correct decision in endorsing Marco Rubio. If you’re looking for someone that will work with the president giving him a well deserved 2 more years to try to repair the mess the previous administration created – then Kendrick Meek is your candidate. And if you’re looking for someone that will work to eliminate partisan politics and analyze each issue and how it impacts America, the American people and the federal deficit – then Charlie Crist is your candidate.